We used ion-exchange resin bags to investigate effects of water additions, chemical amendments, and plant presence on in situ measures of nutrient bioavailability in conjunction with a study examining soil controls of ecosystem invasion by the exotic annual grass Bromus tectorum L. At five dryland sites in southeastern Utah, USA, resin bags were buried in experimental plots randomly assigned to combinations of two watering treatments (wet and dry), four chemical-amendment treatments (KCl, MgO, CaO, and no amendment), and four plant treatments (B. tectorum alone, the perennial bunchgrass Stipa hymenoides R. & S. alone, B. tectorum and S. hymenoides together, and no plants). Resin bags were initially buried in September 1997; replaced in January, April, and June 1998; and removed at the end of the study in October 1998. When averaged across watering treatments, plots receiving KCl applications had lower resin-bag NO 3 − than plots receiving no chemical amendments during three of four measurement periods—probably due to NO 3 − displacement from resin bags by Cl− ions. During the January–April period, KCl application in wet plots (but not dry plots) decreased resin-bag NH 4 + and increased resin-bag NO 3 − . This interaction effect likely resulted from displacement of NH 4 + from resins by K+ ions, followed by nitrification and enhanced NO 3 − capture by resin bags. In plots not receiving KCl applications, resin-bag NH 4 + was higher in wet plots than in dry plots during the same period. During the January–April period, resin-bag measures for carbonate-related ions HPO 4 2− , Ca2+, and Mn2+ tended to be greater in the presence of B. tectorum than in the absence of B. tectorum. This trend was evident only in wet plots where B. tectorum densities were much higher than in dry plots. We attribute this pattern to the mobilization of carbonate-associated ions by root exudates of B. tectorum. 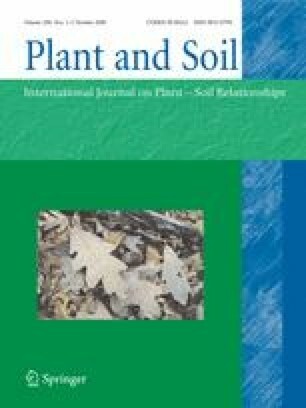 These findings indicate the importance of considering potential indirect effects of soil amendments performed in␣conjunction with resource-limitation studies, and they suggest the need for further research concerning nutrient acquisition mechanisms of B.␣tectorum. Supplementary material is available for this article at http://dx.doi.org/10.1007/s11104-006-9014-6 and is accessible for authorized users. We thank Ann Welshko and Lean Henri for field assistance, Sue Phillips for logistical support, Tina Kister for editorial assistance, and the staff of Canyonlands National Park for facilitating this research. Comments from Tibor Kalapos and two anonymous reviewers improved the quality of the manuscript. This work was supported by the United States Environmental Protection Agency (Science to Achieve Results Graduate Fellowship Program), the United States Geological Survey (Southwest Biological Science Center and Earth Surface Dynamics Program), and the United States Department of Defense (Strategic Environmental Research and Development Program).